Rob Maclean's team of the week: Forrest, Ikpeazu, Souttar and who else? 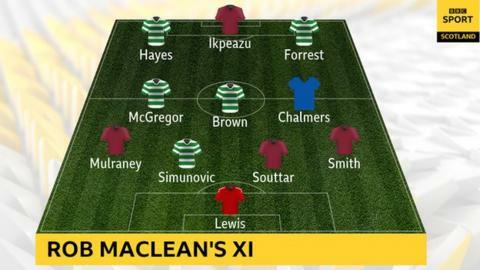 Scottish Cup semi-final goalscorers James Forrest, Uche Ikpeazu and John Souttar are in, but who else features in BBC commentator Rob Maclean's team of the week? 4-3-3 formation: Lewis (Aberdeen); Smith (Hearts), Souttar (Hearts), Simunovic, Mulraney (Hearts); Brown (Celtic), McGregor (Celtic), Chalmers (Inverness CT); Forrest (Celtic) Ikpeazu (Hearts), Hayes (Celtic). Bobby Zlamal or Joe Lewis? Lewis produced a brilliant save in the opening minutes of Sunday's second Scottish Cup semi final to stop Jozo Simunovic scoring. The Aberdeen goalkeeper didn't stand a chance with any of Celtic's three goals at Hampden and did his best to prevent the scoreline getting even worse. Hearts started the season in style and their hopes of a strong finish have been boosted by the return after injury of right back Michael Smith. The Northern Ireland international adds quality and composure and he made an important contribution to Saturday's 3-0 defeat of Inverness. John Souttar delivered a polished performance as Hearts clinched their place in next month's Scottish Cup final. His distribution of the ball out of defence is always a big plus and, at the other end, his anticipation was spot-on, nipping in to score his first goal in more than a year. Celtic's Simunovic, who's had a mention already, must have had one of his best games in hoops. Yes, he should have scored from just a few yards out but he was unlucky with a couple of longer-range efforts and he formed a solid defensive partnership with Kris Ajer. I know Jake Mulraney played further forward on Saturday but I'm going to pick him as an attacking left back. He played a big part in Hearts' well-worked opening goal against his old Inverness team-mates at and was a constant menace with his darting runs down the flank. Scott Brown barely broke sweat on Sunday as the Celtic captain dictated the play straight from kick-off. Aberdeen's Stevie May had been detailed to get close to Brown and, when May was sacrificed after Dom Ball's red card, the outcome, with Brown given the freedom of the midfield, was inevitable. Alongside the skipper, Callum McGregor's performance was all about calm authority as he switched play around the Hampden pitch. With those two in perfect harmony, Aberdeen would have struggled even if they had managed to keep all eleven players involved in the action. Inverness midfielder Joe Chalmers thought the ball was heading for the top corner to make the score 1-1, the moment he struck that free kick on Saturday. Only a special save from Zlamal denied him. Chalmers was generally involved in Caley Thistle's best moments. Celtic fans will hope that James Forrest, who's been at the club since he was a nine year old, wants to end his playing days there as well. There will surely be offers in the summer for a player who's spectacular strike at Hampden was his 22nd goal of the season for Celtic and Scotland. Forrest is quite simply a class act. Uche Ikpeazu might not be too easy on the eye at times for lovers of the beautiful game but the powerful Hearts striker is certainly effective. He showed sharp reactions to score the opener and won the penalty for the third goal. That's a sizeable contribution. Neil Lennon, since his return as Celtic manager, has given a vote of confidence to winger Jonny Hayes and the response on the pitch has been impressive. He tormented his old team on Sunday and Scott Sinclair might have to get used to a seat on the bench with Hayes on this sort of form.